Our thermoplastic Ridgidrain surface water drainage pipes in diameter 100-600mm and our Ridgistorm-XL large diameter pipe system in diameter 750-3000mm are both quick to install, because they are lighter in weight and available in longer lengths, when compared to traditional systems, which is invaluable on large scale infrastructure projects where time makes up a large proportion of the overall construction cost. Ridgidrain and Ridgistorm-XL are both compliant with Highway England’s MCHW, Volume 1 Specification for Highway Works Series 500 with AIP acceptance through the BD2/05 Standard for Highways Schemes for diameters 1050-3000mm. Ridgidrain is BBA HAPAS approved. Polysewer and Ridgisewer are ideal surface water drainage systems for private roads that are adopted by water companies, where installations need to be in accordance with Sewers for Adoption. Managing surface water as close as possible to where it falls is a key aspect of source control and SuDS. 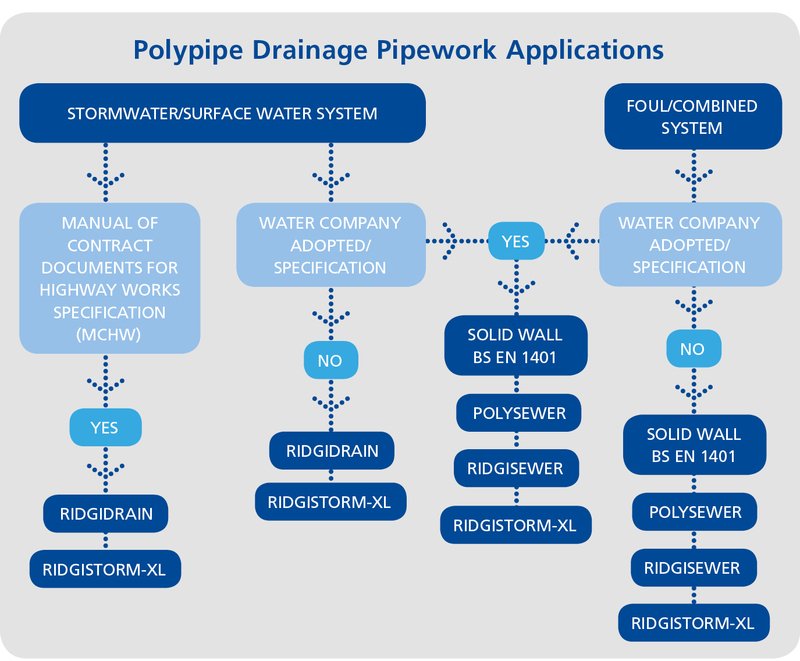 Polypipe solutions such as the Ridgistorm-XL large diameter pipe system and Polystorm geocellular system have the ability to store large volumes of surface water at the side of the road for either infiltration or attenuation. RIDGISTORM Check Chambers can be utilised for flow control in attenuation applications. Surface water treatment solutions are available to separate and remove silt, oil, phosphorus and heavy metal pollutants. These include our RIDGISTORM Separate Silt Traps and Catchpits, RIDGISTORM-X4 treatment devices and Ridgitreat treatment pipes.